Here are some snazzy birthday facts about 10th of February 1988 that no one tells you about. Don’t wait a minute longer and jump in using the content links below. Average read time of 10 minutes. Enjoy! What day was my birthday Feb 10, 1988? February 10, 1988 was a Wednesday and it was the 41st day of the year 1988. It was the 6th Wednesday of that year. The next time you can reuse your old 1988 calendar will be in 2044. Both calendars will be exactly the same! This is assuming you are not interested in the dates for Easter and other irregular holidays that are based on a lunisolar calendar. There are 293 days left before your next birthday. You will be 32 years old when that day comes. There have been 11,395 days from the day you were born up to today. If you’ve been sleeping 8 hours daily since birth, then you have slept a total of 3,798 days or 10.40 years. You spent 33% of your life sleeping. Since night and day always follow each other, there were precisely 386 full moons after you were born up to this day. How many of them did you see? The next full moon that you can see will be on May 18 at 21:13:00 GMT – Saturday. Fun stat: Your first one billion seconds (1,000,000,000) will happen sometime on October 19, 2019. If a dog named Jynger - a Goldador breed, was born on the same date as you then it will be 182 dog years old today. A dog’s first human year is equal to 15 dog years. Dogs age differently depending on breed and size. When you reach the age of 6 Jynger will be 45 dog years old. From that point forward a large-sized dog like Jynger will age 5-6 dog years for every human year. The St Scholastica Day riot breaks out in Oxford, England, leaving 63 scholars and perhaps 30 locals dead in two days. Queen Victoria of the United Kingdom marries Prince Albert of Saxe-Coburg-Gotha. Józef Haller de Hallenburg performs symbolic wedding of Poland to the sea, celebrating restitution of Polish access to open sea. Italy cedes most of Venezia Giulia to Yugoslavia. United States President Dwight Eisenhower warns against United States intervention in Vietnam. A fire at the Las Vegas Hilton hotel–casino kills eight and injures 198. What does my birthday February 10, 1988 mean? 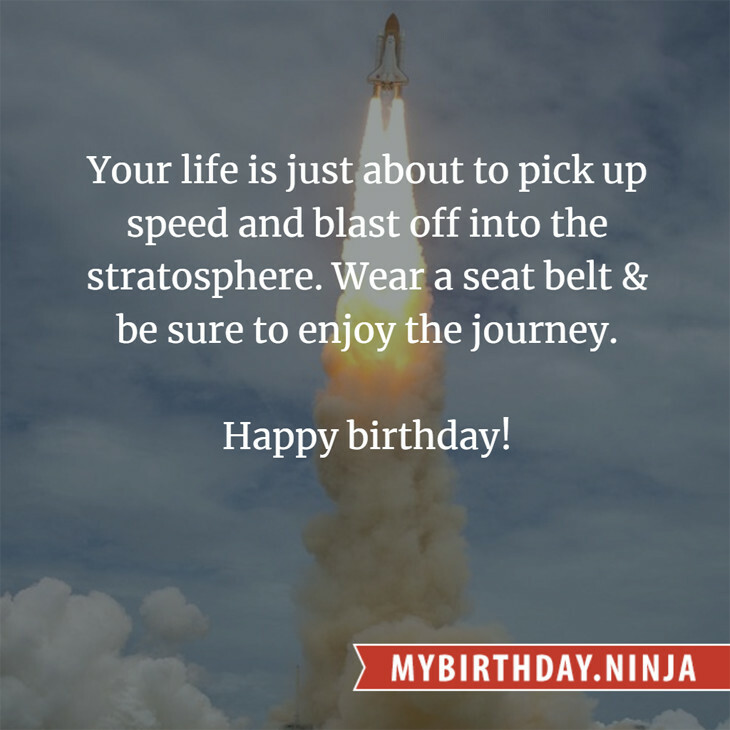 Your birthday numbers 2, 10, and 1988 reveal that your Life Path number is 11. It is a master number that represents intuition, idealism and invention. You have the potential to be a source of inspiration and illumination for people. The following celebrities also have the same life path number: Slater Young, Walt Flanagan, Igor Jijikine, Patrick Casey, Kate Magowan, Helen Watts, Gyptian, David Morrissey, Kelly McGillis, Isaac Brock. 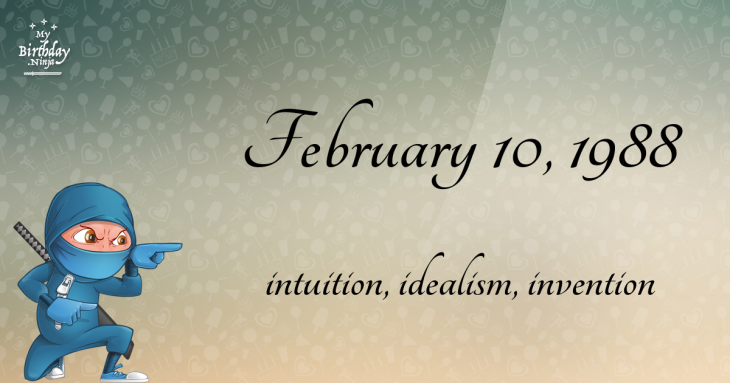 What is the birthday horoscope for Feb 10, 1988? The Western zodiac or sun sign of a person born on February 10 is Aquarius ♒ (The Water-bearer) – a fixed sign with Air as Western element. The ruling planet is Uranus – the planet of originality. According to the ancient art of Chinese astrology (or Eastern zodiac), Rabbit is the mythical animal and Fire is the Eastern element of a person born on February 10, 1988. Fun fact: The birth flower for 10th February 1988 is Violet for modesty. What is the Love Match for Feb 10, 1988? When it comes to love and relationship, you are most compatible with a person born on March 1, 1964. You have a Love Match compatibility score of +214. Imagine being in love with your soul mate. On the negative side, you are most incompatible with a person born on September 19, 1989. Your incompatibility score is -212. You’ll be like a cat and a dog on a love-hate relationship. Arf-arf, I want to bite you. Meow-meow, stay away from me! The number-one hit song in the U.S. at the day of your birth was Could’ve Been by Tiffany as compiled by Billboard Hot 100 (February 13, 1988). Ask your parents if they know this popular song. I do not know how you feel about this, but you were a male ♂ in your last earthly incarnation. You were born somewhere around the territory of Ontario approximately on 1675. Your profession was dramatist, director, musician, bard. How many babies were born on February 10, 1988? Base on the data published by the United Nations Population Division, an estimated 139,142,510 babies were born throughout the world in the year 1988. The estimated number of babies born on 10th February 1988 is 380,171. That’s equivalent to 264 babies every minute. Try to imagine if all of them are crying at the same time. What is the popular baby name on 10 Feb 1988? Here’s a quick list of all the fun birthday facts about February 10, 1988. Celebrities, famous birthdays, historical events, and past life were excluded. Try another birth date of someone you know or try the birthday of these celebrities: April 26, 1942 – Bobby Rydell, American singer and actor; April 10, 1930 – Lee Weaver, American actor; March 23, 1980 – Itay Tiran, Israeli actor.